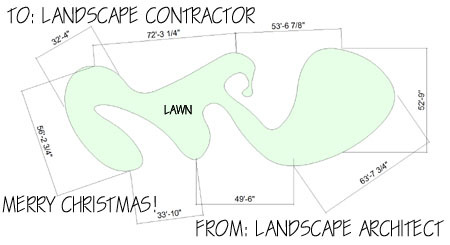 I have a Christmas gift request for all our landscape architects friends out there from all the contractors that construct your projects. Would it be so hard to just include a quick quantity take-off on your plans? Two clicks and you could give us the square footage of that 5000 square foot lawn with enough organic bezier curves to make Pierre Bézier himself crazy (the inventor of a type of adjustable curves for computer drafting). As a stocking stuffer could I request that detail sheets with your plans proceed in some logical order and be adequately labeled. Happy Holidays from O’Connell Landscape!